Media expert and journalist stole my photo! In a changing media landscape where bloggers are given flack for lack of credentials, a journalist and media expert uses a picture I took without permission, credit, or at least, ‘link love’. I just busted Newsbusters for stealing a picture I took which they posted on their website. 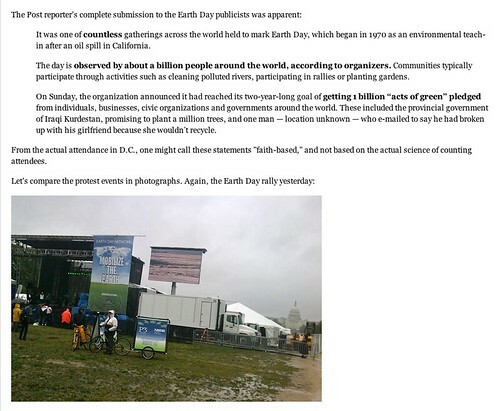 In Tim Graham’s blog post “WashPost Disguises ‘About 40 People’ Hung Out at DC’s Earth Day Rally!“, he made no mention of any source of the picture of the Earth Day celebration which he compared to a crowded March for Life rally last January. Yet take note he linked to traditional news outlets like the CNN and the Washington Post. Are bloggers not to worthy of permission or credit? By checking the image URL he used, I confirmed that it is identical to the image URL of the picture Iposted on my Facebook photo album. Another blogger who has the same political stance as he does also used some of my pictures, who linked to my blog that created a blog ‘pingback’ that notified me via email. NewsBusters is a blog whose goal is “exposing and combating liberal media bias”. Thus I find it ironic to be exposing and combating them for a media malpractice. This mistake would have been more tolerable had it been committed by someone not familiar with journalism ethics. But the erring writer is not an occasional blogger. At present, he is the director of media analysis for Media Research Center, the host organization of NewsBuster. He is also a former correspondent for the White House and has published two books about the media. I may be no superstar blogger and still aspiring to break into journalism and the communications field, yet I try my best to follow one of the main tenets of journalism, which is source attribution. I’ve done so, be it on this blog or the newsletters I send out as part of my day job. Otherwise, and to the extent possible, I produce my own content to build my own portfolio, and take pride in my work. I braved the dreary weather last Sunday at the National Mall, took pictures of the event myself and posted it on Facebook and on this blog. I may have the convenience of living and being based near the National Mall, but so is NewsBuster’s host organization, Media Research Center. It is based in Old Town Alexandria, Virginia. It is a short car trip over the Anacostia River to the National Mall. Or just a 25-minute Metro ride on the blue line to the Smithsonian station- without any Metro station transfer involved. I know the Metro has its shortcomings, especially the less frequent trips Sundays. But that is still no excuse. The internet and smartphones have democratized the media. New media tools have given rise to crowd-sourcing and social media making it much easier to produce online content. But if I were serious about the craft of journalism or would like to strengthen my own propaganda work, I would have gone to the National Mall that Sunday and documented the event myself. As the saying goes, keep your friends close, but keep your enemies closer. Perhaps the only valid excuse from Tim Graham and NewsBusters/MRC is that the unusually wet and cold weather may have deterred them from dropping by the National Mall to take their own pictures. This may also be acceptable for many Earth Day supporters Graham criticized in his blog. “Exposing and combating liberal media bias”??? I find it a joke that Tim Graham uses an obviously biased tone in describing the Earth Day events. You made a good point: Tim and his team were deterred by the rain to take photos by themselves, yet they stole your photos to support the argument that no one showed up at the event. Sue him, please. Hi Xueying, I already emailed Media Research Center, the host organization of Newsbusters, last Friday. I’ll keep everyone updated on this blog. I was also advised to get in touch with MRC and I did so by email today. shame, shame, shame. complain to him, Media Research Center and like-minded blogs. it is not acceptable. intellectual dishonesty. he should either pull it out or apologise or your can even ask for compensation. . you can even sue. you should write to this guy and request him to pull out your photo.dont even be nice about it. even if there will be no legal punishment for what he did, mapapahiya din yun.